�April is coming. There are many major festivals you should not miss in this April. This is an occasion for you to travel and learn about the national culture. In April 3th in lunar calendar, many people flock to Kim Thai commune, Vu Ban district, Nam Dinh province to attend Phu Day festival. Tourists come here to take part in the anniversary of Princess Lieu Hanh’s death, to visit the temple and to enjoy Chau Van singing. On March 3rd in lunar calendar, there will be a festival to honour Thien Y A Na – a god of Champa in Ngoc Tan mountain and Hai Cat communal house of Huong Tra district, Thua Thien Hue city province. The festival takes place in decorated boats on Huong river in the evening. In the last day, people will set free for birds and drop coloured lanterns on the river. On March 8th in lunar calendar, in Tran Hung Dao temple, Vua Ba shrine and temples in Yen Hung district, Quang Ninh province, there will be a festival to honour national heroes fighting against the foreign invader on Bach Dang river. The festival includes the procession and some activities such as boat racing, wrestling, human chess. 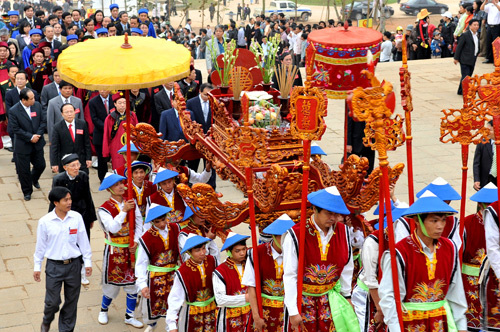 Coming to Kieng Phuoc commune, Go Cong Dong district, Tien Giang province on March 10th in lunar calendar, visitors can attend the festival hold in Nam Hai royal tomb. Besides, the festival hold on sea with hundreds of decorated boats, singing performance, and traditional games are very interesting.